VOICE And CROSS Of Light At CONVERSION It was the strange "Call of the West" in his heart that caused him to move out to Arizona in 1927. But two years later, while still enjoying the rugged western way of life as a cowboy, he received devastating news from home - his brother Edward had passed away. You can imagine the shock this was to a young man of about 21 years old as he realized he would never see his brother alive in this world again. The memories began to force their way into his mind as he stood in a daze, gazing across the yellow prairie. The tears came as he remembered how, as lads they had struggled together and how hard it had been - going to school with hardly enough clothes to wear, hardly enough food to eat, and with the toes out of their shoes. Then another memory flashed before him in his mind - oh how he wished he could reach back in time and change it. How he wished he could tell Edward about it - but now it was too late. He remembered the day that their mother had given them a real treat - some pop corn in a little bucket - it was to be lunch for Edward and himself at school that day. But to be sure he got his share of it, Billy went out before noon and took a good handful before his brother got his share. When lunch time arrived both brothers went somewhere alone to share their meager lunch. Opening the bucket, Edward exclaimed, "Someone has taken some of our pop corn." Billy agreed but never did tell his brother who the guilty person was. Standing there, looking on the sun-parched prairie these things weighed heavy on his heart. He thought of God, the God he had been running from when he moved out West. He considered whether or not Edward had been ready to meet God. Turning Eastward, Billy made his journey back to Jeffersonville for the funeral. En route to Jeffersonville another thought troubled his young mind: "Are "You" Ready To Meet God?" This funeral, like all funerals was mournful, but more so, in that the deceased was so young (about 20 years old). On Billy Branham's shoulders was more than the load of grief he felt at the loss of his brother - he was under spiritual conviction regarding the Salvation of his own soul. It seemed as if the preacher was talking directly to him when he said, "There are some here NOW who do not know God." As Rev. 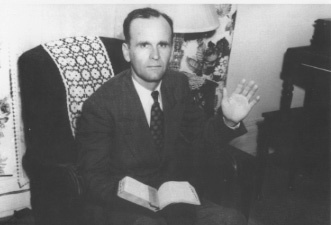 McKinney of Port Fulton Church, encouraged the sinners to accept (now) Jesus Christ as their Lord and Saviour, Billy grasped his seat; God was once again "calling this fugitive" to turn his life over to the Lord Jesus Christ. God was catching up with young Billy Branham. The time was fast approaching when the Lord would require his services. Billy was ever aware of this Voice, this Presence that he had experienced since he was a baby, wishing to speak to him. This "strangeness" about him separated him from the other boys his age, preventing their friendship because he spoke of strange things. He refused to smoke, drink, dance, or run around as they did. He much preferred the seclusion of the wilderness. Though he couldn't pattern his life of theirs, yet he didn't know HOW to surrender himself to God. But through the death of Edward he stopped running from God, and the Spirit of God continued to be with him and brought him to the place where he actually tried to pray. He didn't know how, but loving the wilderness, he wrote on a piece of paper, "God Help Me!" He left the note stuck on a tree because he knew that God was there in nature. Still he found no peace of heart. He went from church to church. One pointed him in that direction; another pointed him in another direction, but nothing satisfied. Finally, one night he became so hungry for God and a 'real' experience that he went out to an old shed at tha back of their hime and tried to pray. Not knowing exactly 'how' to pray he just talked to God as he would in normal conversation to anyone else. Then there came a LIGHT in the shed and it formed a Cross, and a VOICE from the Cross spoke in a language he could not understand. It then went away. Billy was shaken. He felt cold and numb all over, but when he 'came to himself again, he prayed saying, "Lord, if that is you, please come back and talk to me again." Within the last few weeks he had been reading his Bible and he knew that 1st. John 4 said, "Believe not every spirit, but try the spirits whether they are of God." He knew that something had happened to him and as he prayed the second time, it appeared again - the LIGHT in the form of a Cross. In his own words he said, "Then it seemed to me that there had been a thousand pounds lifted from my soul." Something swept over him and he experienced an exquiste feeling he had never know before. He said it felt like rain was pelting down on his body. He knew then that God had forgiven him of his sin and baptized him with the Holy Ghost. With no other way to express his extreme joy and relief, he stood to his feet and began to leap and run about. He ran into the house and his puzzled mother asked him what was wrong. "I don't know," he replied, "I just feel so light!" With those words he ran out of the house and down the road, using the only way he knew to express his elation. After his conversion, when he begin to see the error that the denominational churches had gotten themselves into he said, "I'm so glad that God got a hold of me before the church did. I'd probably been an infidel, yes, sir, all this conglomeration of mess and everybody. "Well, come over and join ours. And if you don't, well, you can pick up your letter and go join the other one." Oh! "Won't you bring your letter into our fellowship?" I believe there's one letter, that's when Christ writes your name on the Lamb's Book of Life."